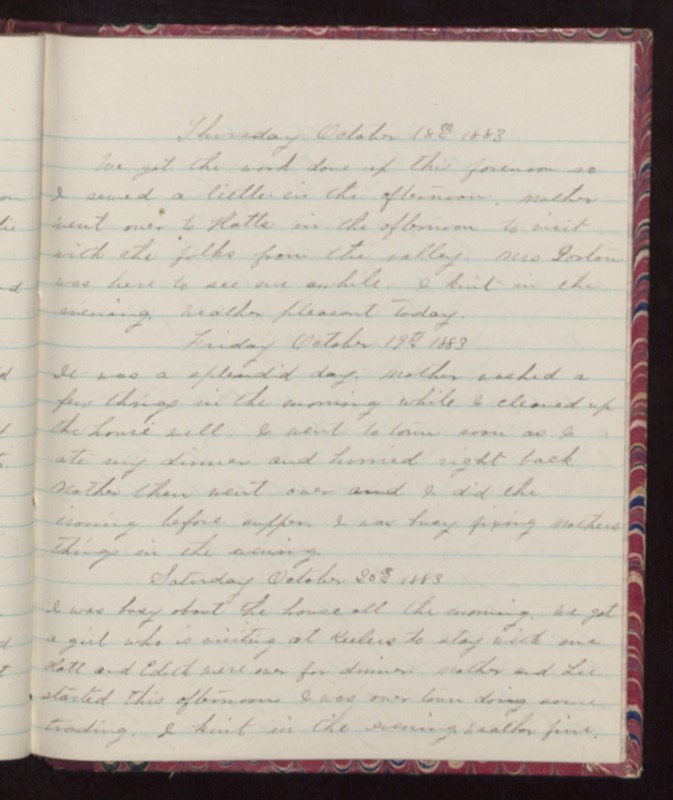 Thursday October 18th 1883 We got the work done up this forenoon so I sewed a little in the afternoon. Mother went over to Hatts in the afternoon to visit with the folks from the valley. Mrs Gorton was here to see me awhile. I knit in the evening. Weather pleasant today. Friday October 19th 1883 It was a splendid day. Mother washed a few things in the morning while I cleaned up the house well. I went to town soon as I ate my dinner and hurried right back. Mother then went over and I did the ironing before supper. I was busy fixing Mothers things in the evening. Saturday October 20th 1883 I was busy about the house all the morning. We got a girl who is visiting at Keelers to stay with me Hatt and Edith were over for dinner. Mother and Lee started this afternoon I was over town doing some trading. I knit in the evening. Weather fine.